Want to surprise your love one with a really special gift which could treasure for a lifetime. Here is the solution Custom bollywood posters paints on canvas from Bollywood posters studio. Contact no. +919022034923. Our email : bollywoodpostersstudio@gmail.com . We will commissioned a hand painted custom Bollywood posters paints on canvas featuring you and yours partner as the stars of their very own movie. You had to just send your hd photos to us through email. Hand painted on canvas using a traditional blend of oil paints, the poster was made by Bollywood posters studio’s team comprising the last few remaining Bollywood movie poster artists in India who had been working since last 40 years. Our artist had magic in every brush stokes. Our artist of old Indian bollywood cinema will convert life less blank canvas into ” A PERFECT MASTER PIECE OF ART” the hand painted custom poster with their Brush stokes. The painting itself speak and express you Love. Bollywood posters studio’s Customized Bollywood posters paint on canvas brings back to life the age-old practice of hand painting Bollywood movie posters on canvas.The only difference is that instead of painting movie stars faces, the artists now paint the faces of our clients. Bollywood poster studio assure you will love the vintage feel of old hand painted Bollywood movie posters and amazed to see the same recreated especially for you. And you will feel like a star of your very own favourite movie. Bollywood posters studio’s Customized Bollywood poster paint on canvas come with a lifetime guarantee on colors. Custom Bollywood posters is an excellent way for couples to immortalize their love story on canvas. Once painted, the poster becomes a lifelong keepsake. Bollywood posters studio creates your Bollywood spoof, dramatic effect, retro Bollywood look, vintage look all kinds of old classic Bollywood filmy layout for you on canvas. 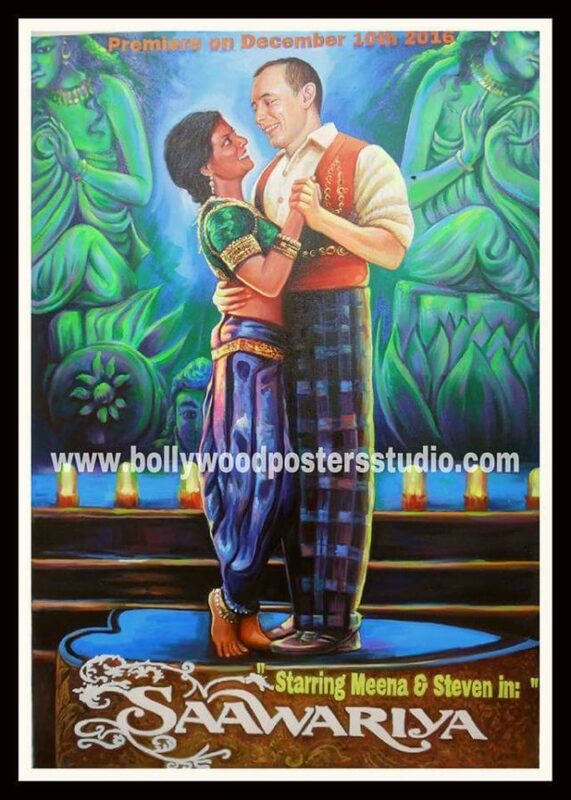 Order online today hand painted customized Bollywood poster art today !! !